I’m pretty sure (though could be wrong) that Easy Cheese was the only cheese in a can before Cheez-It tried it’s hand at the can. Both products are dispersed in the same way, are labeled as “Pasteurized Cheese Snack” and also claim to be made with real cheese. All three of the characteristics are usually a turn-off to most people. This evaluation was conducted with Ethan and our friends Sarah and Mark and then I brought the cans into work to get my co-workers’ feedback. Some of the first comments on this were that it didn’t smell that great. The texture is smooth and creamy. Comments on the taste overall was that it was very mild, and some said tasted more like American than cheddar but some people liked that and thought it went well with crackers. This had a darker color and had a cheddary smell. The texture was the same but it was unanimous that the flavor was a lot stronger. It was described as concentrated, overpowering, sharp, macaroni and cheese-like. Depends on who you ask but the strong flavor of this proved to be too much for most people but the research assistant at work and I both liked this. In fact we found that it went particularly well with pretzels. I’d like to give Cheez-It points for having a tangy sharp cheddar taste but for those looking for a mild, but pleasant cheese flavor would prefer Easy Cheese. So if you mixed them both together, would it destroy God? I’ve never seen cheese like this before! Wow 🙂 I don’t know if i could…but if it ever comes to australia i might just try it. I’m almost positive that Cheez Whiz once came in a can like that but moved to a jar. I’m finding precious little evidence on the internet to back me up, though. I don’t admit this freely, but I LOVE EASY CHEESE. Please don’t tell anyone. They make a bacon easy cheese too. The advertise it on the back of the regular can, but I have never seen it in stores. Wow, this site rocks, I just found it. Love the user feed back, and comparisons rock. I had it a while ago but I remember the Cheez-It version being not-so-good. Despite my love for the crackers themselves. I love aerosol cheese. Thanks for this post – I just picked up a can of Cheez-It at Big Lots, and haven’t had time to evaluate it yet. 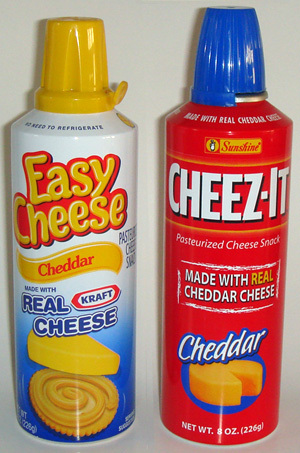 I have a memory with these- One time I was at my friends’ house for his birthday party and he was bragging he had the only can of Easy Cheese.. so I grabbed a pair of pliers from his dad’s toolbox and pulled the little rubber stopper on the bottom and the cheese went all over his shirt. I then grabbed a cracker and stuck it on the cheese-covered shirt.. and asked, “Need some crackers?” LOL.. the memories! Yeah.. I live in Australia.. and am so BUMMED.. there are NO Cheeze its out here. I probably would have 2nd guessed moving out here, if I had known beforehand. lol.